More and more people all around the world are going green as they attempt to live their lives in a way that respects and protects nature and the environment. The eco-friendly trend has carried over into wedding planning with many couples trying to incorporate green elements into their wedding day. Though you may not be able to have a completely green wedding, these tips can help you do your part. When choosing your wedding invitations, select a printing company that uses recycled paper along with soy-based ink. Don't think eco-friendly paper is ugly. You can find gorgeous invitations made from recycled cotton fibers, or handmade plantable paper embedded with flower seeds. This paper should be used not just for your invitations, but also for your menus, place cards and programs as well. Also make sure to use cloth napkins instead of paper at your wedding reception. Instead of buying a new wedding gown, consider purchasing a vintage dress from a thrift shop or resale clothing store. If you want a new dress, choose a style that you will be able to wear again and again. You don't need to pick white, as colored wedding dresses are becoming more and more popular. Choose silk, hemp or other eco-friendly fabrics. If you aren't going to wear your wedding dress again, donate it to charity or a family member. Instead of buying "blood diamonds" (those which are mined in war zones and fund the conflicts), consider a vintage ring from a family member or local antique shop. If diamonds are a must, choose those that are mined in peaceful areas - like Canada! For example, Brilliant Earth offers gorgeous rings and other jewelry that are mined in conflict-free Canada. And what's more, 5% of their profits are donated to African communities in need. At least one bride this year had her guests actually power the wedding by riding stationary bikes! Plan an outdoor wedding to avoid using as much electricity as possible. Don't think outdoor weddings are just for daytime. You can create a beautiful atmosphere for an evening wedding using plenty of candles. Soy and citronella candles are earth-friendly and lend to a romantic setting. If you are planning a candlelight wedding, just be sure that your photographer and videographer are experienced with low-light photography. Select seasonal flowers that are locally and organically grown. Ask your florist for eco-certified flowers. 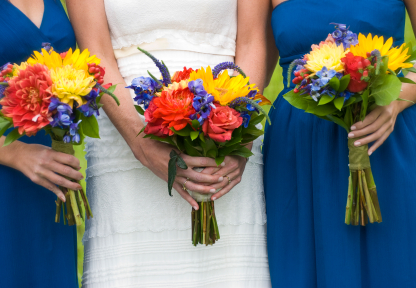 After the wedding is over, you can donate the flower arrangements to local hospitals or other care facilities rather than just throwing them away. For centerpieces, you can also use flowering plants that can be re-planted rather than flowers. Allow the eldest (or the youngest) guest from each table to take the plants home after the reception. When planning your reception menu, select locally grown organic food, coffee and wine. Organic foods are produced without chemical fertilizers, antibiotics or pesticides, which are harmful to both people and the environment. Wines of Canada offers information and a list of organic wines that are available in Canada. If you are serving seafood, be sure that it's not depleted or endangered. Donate leftover food from your reception to a local soup kitchen. 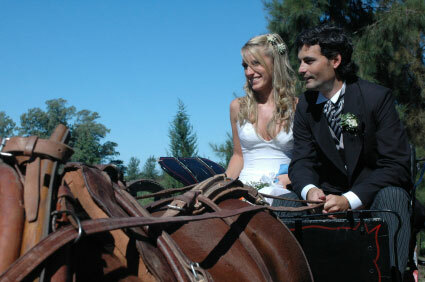 Instead of a gas-guzzling sports car or limo, arrive at your wedding in a horse-drawn carriage. It's beautiful and romantic, plus they'll be no fuel usage or air pollution. When leaving the reception to head to the airport or hotel, rent a hybrid vehicle. Encourage your guests to carpool to and from the ceremony and reception sites. You can also arrange for shuttle service to save gas and avoid drunk driving. Instead of traditional wedding favors, give your guests eco-conscious favors such as flower seeds, tree saplings or plant bulbs. Re-usable shopping totes, fair trade coffee and teas, or all natural soaps and bath products are also wonderful choices. When setting up a wedding registry, look for stores that give back a percentage of each gift purchased to eco charities. One example of this is Cooking.com, which donates 10% of purchases from the registry to a charity of the couple's choice at no extra cost to you or your guests. Look for other ways to give back at the I Do Foundation. Also, check out DreamBank. When you are planning your honeymoon, select a hotel or resort that is eco-friendly. Green hotels use low wattage light bulbs and water saving showerheads, change towels and sheets only by request, avoid using plastic bottles, have an established recycling program and are otherwise dedicated to preserving and enhancing the environment. You can find a list of green hotels around the world at GreenHotels.com.